In addition to releasing highlighting palettes, COVERGIRL has also come out with some highlighting/blush/contour palettes that also work quite nicely together. These palettes are all-in-one palettes to color, contour and highlight. The COVERGIRL TruBlend Serving Sculpt Palette provides everything you need to enhance and illuminate your natural features. Carefully curated, tonal shades provide depth and dimension that will flatter any skin tone! 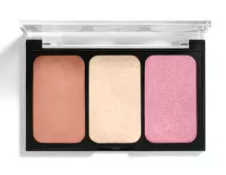 These come in two tones, Rose Nights with a light pink blush, medium contour shade and a white gold highlighter. Bloom Babe is a little darker and comes in a bright pinkish blush, a slightly darker contour and a golden-peach highlight. I like these because they end up looking very natural and brighten up the complexion. On my very fair skin tone these look quite nice and really make my cheeks pop. These would look natural on any light to medium skin tone. I would think that darker skins could wear this but the contour would not show up likely. This kind of palette is on trend now and will likely stay on trend for the next year or two. The color goes on evenly and is easier to work on lightly a little bit at a time than to put on a lot at once because it is very pigmented as you can see from the swatches below. COVERGIRL TruBlend SERVING SCULPT PALETTE retails for $9.99 and can be found at mass market retailers such as Walgreens, Rite-Aid, CVS, Walmart, Target and Ulta Beauty. Like COVERGIRL on Facebook: https://www.facebook.com/covergirl; Follow COVERGIRL on Twitter: @covergirl; Follow COVERGIRL on Pinterest: https://www.pinterest.com/covergirlxo/; Subscribe to COVERGIRL on YouTube: https://www.youtube.com/user/CoverGirl; Follow COVERGIRL on Instagram: https://instagram.com/covergirl/; Follow COVERGIRL on Tumblr: http://covergirl.tumblr.com/; Follow COVERGIRL on Vine: https://vine.co/u/907771872836456448, Follow @COVERGIRLXO on Snapchat and Follow COVERGIRL on Google+: https://plus.google.com/+covergirl/videos.